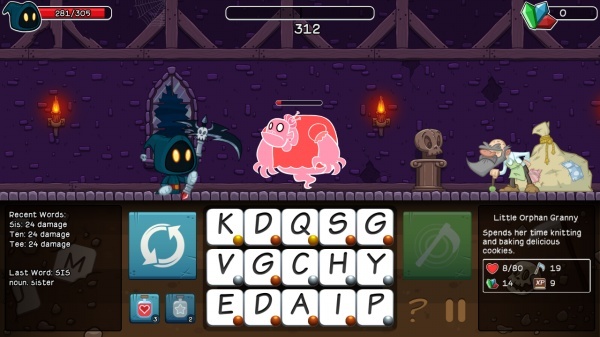 Letter Quest: Grimm's Journey is an entry in the underrepresented genre of spelling RPGs. Let me explain. Each of the game's levels features a battle or two against monsters that look more huggable than they are dangerous, but dangerous they are and to defeat them you're going to have to some spelling - the letter kind, not the casting kind. Each time you encounter a monster you'll be given a random assortment of fifteen letters laid out on a grid. To attack the monster you'll need to form a word from these letters, and the longer the word, and the more of the language's less frequent letters that you use, the greater the damage to the monster. The monster than gets to attack you, no spelling required, and turns alternate until either you or the monster is out of hit points. Things soon start to get a little more complicated for you, though. Some monsters will mess with your word grid, turning some letters poison to use, cracking them so that they don't cause any damage, and other such nasty tricks. Others will only be damaged by words that meet certain restrictions such as being of a set length, words that begin with a vowel, or that are formed using at least two letters that sit in the corners of your word grid. Some levels also contain treasure chests and opening them will require a word game, of course. The treasure game is a bit like Hangman or Wheel of Fortune. You're given a word with all of the letters missing and you must guess what those letters are. You have a limited number of guesses, though, so you'll have to be smart about it. I liked that the treasure words weren't gimmes - the first one I ran into was "rhubarb" - and that they're a nice change of pace between the monster fights. Survive the level and you'll earn gems that can be spent on upgrades and power-ups. Some are straightforward, like healing potions and upgrades to your maximum health, while others are boosts tied to the words you spell, such as restoring a bit of your health when you spell words using a certain letter. Levels can each be played through four times. The first is the "normal" play-through, the second is a timed version of the same level in which you're competing against both the monsters and the clock. The third version increases the challenge by, and the fourth. You must complete all versions of a level to get a four-star rating on it, but only the first star is necessary to unlock the next level for play. Letter Quest hooked me on its gameplay pretty quickly, although I must warn you that I am already partial to word games. What makes Letter Quest stand out from other word games to me was the challenge of making words under its ever-changing restrictions while trying to maximize the positive benefits I would get from each word played. It's not an easy game - four-starring each level will take a little work, but those of you who like to use your brain while playing games will thrive on the challenge. Also working in the game's favor is its charm and sense of humor. The cartoon style graphics are appealing and I loved reading the clever descriptions of each monster I faced, even when they beat me to a pulp a few minutes later. The game has an extensive dictionary and when you play a word you'll see its definition in the lower left corner of the screen. You'll probably know the definitions of the words that you're playing (you're not hoping to luck into a random word, are you?) but you'll want to read the definitions anyway as the game can be a little playful with these as well. 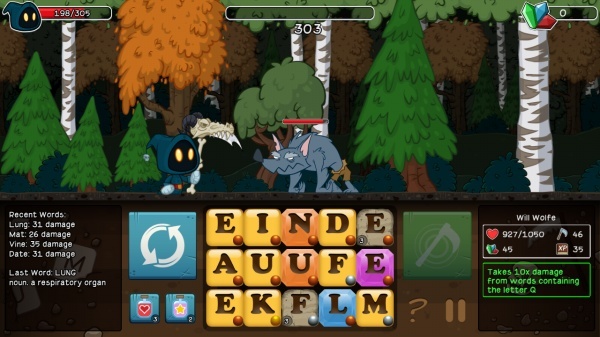 Letter Quest: Grimm's Journey is fun, challenging, and charming, all things that make for a great word game. This is a journey well worth taking for fans of word games. Final Rating: 90%. Word game fans will quickly fall under Grimm's spell.